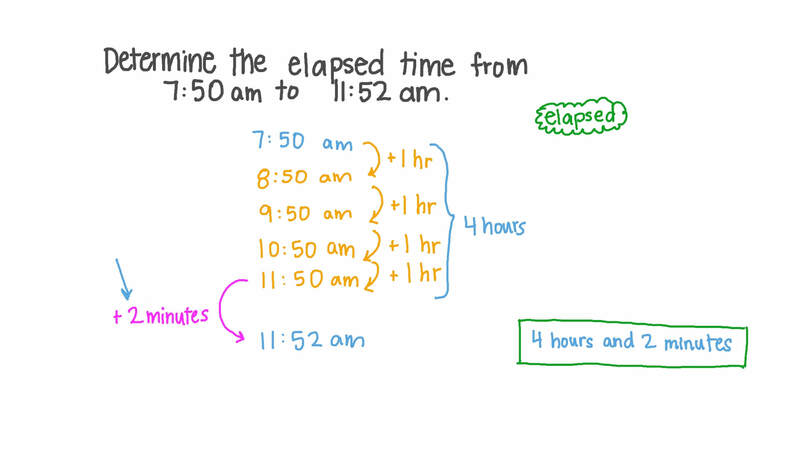 In this lesson, we will learn how to solve problems on elapsed time by subtracting the starting time from the ending time. Determine the elapsed time from 07:50 am to 11:52 am. Find the elapsed time from 02:43 pm to 08:28 pm. 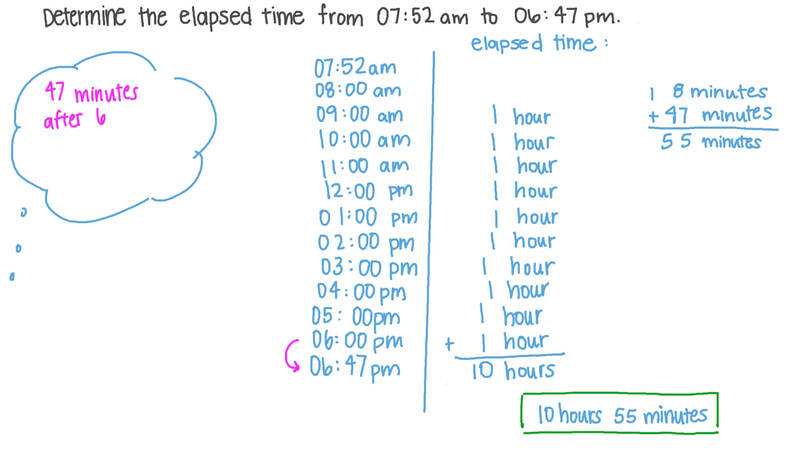 Determine the elapsed time from 07:52 am to 06:47 pm. 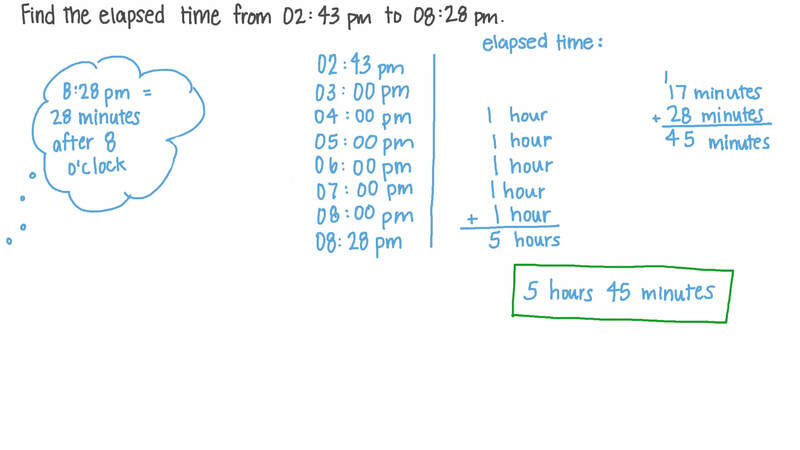 Determine the elapsed time from 09:37 pm to 04:11 am. Determine the duration of a movie that started at 10:30 am and ended at 12:52 pm. Nader started studying at 3:59 pm and finished at 9:40 pm. How much time did he spend studying? If Shady started his homework at 5:20 am and it took him 50 minutes to complete it, when did he finish? It takes Dina 2 hours and 45 minutes to cycle around the town. If she starts cycling at 8:00 pm, when will she finish her lap? A movie screening ended at 11:18 in the evening. If the movie lasted for 1 hour and 46 minutes, determine the time at which it started. Nada leaves her house to walk to the library at 10:30. The walk takes her 15 minutes. What time does she arrive? Which clock shows the time 2 hours earlier? What will the time be 10 hours and 54 minutes after 10:39 pm? What will the time be 2 hours and 34 minutes after 8:35 am? Rania began her exercise at 08:47 am and finished at 11:27 am. For how long did she exercise? Fady spent 40 minutes playing tennis and finished at 3:15. What time did he start playing? If Sherif finished his homework at 6:03 pm, and Adam finished his at 7:57 pm, how many minutes earlier did Sherif finish? Two basketball matches were played. The first started at 9:10 pm and ended at 9:41 pm. The second started at 4:00 pm and ended at 4:43 pm. Which match was longer? AThe first match was longer. BThe second match was longer. CThe two matches were equal in time. Yara left her house at 06:54 am to go to school and returned at 03:31 pm. Determine the time elapsed from the moment she left the house to the moment she returned. Rania started washing the dishes at 5:33 pm and it took her 25 minutes. At what time did she finish? If the time now is 9:22, what will the time be after 34 minutes? Amir takes the 7:11 am train to work, and the journey takes 26 minutes. What time does he get to work? Sarah entered the supermarket at 5:19 pm and left at 6:51 pm. How long was Sarah at the supermarket? If the time now is 5:27 pm, after how many minutes will the time be 5:49 pm? In the afternoon, Adel’s family went to the library at the time shown. They stayed until 5:30 PM. How much time did they spend at the library?